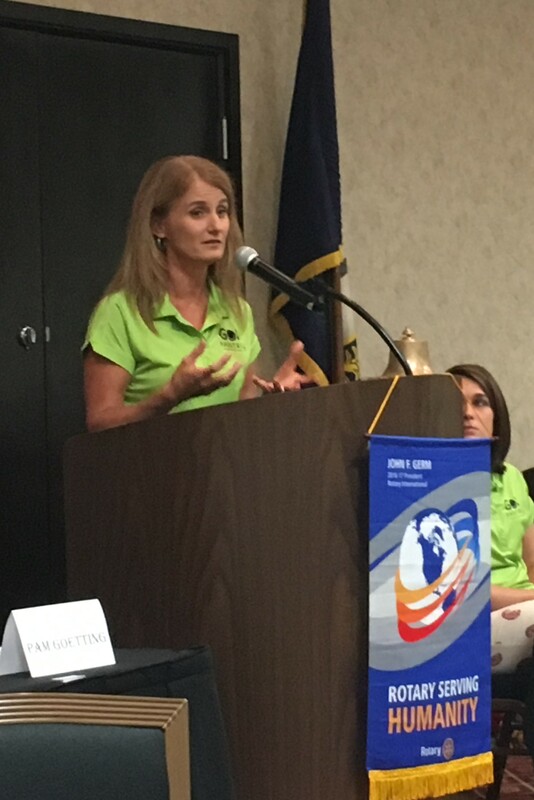 The Rotary Club of Florence recognized three women who are the driving force behind GO Pantry as its Citizens of the Year for 2016 at its weekly meeting. Adam Howard, immediate past president of Florence Rotary, said Laura Dumancic, Katie Hiatt and Beth McIntire were chosen because of their outstanding example of serving the community. 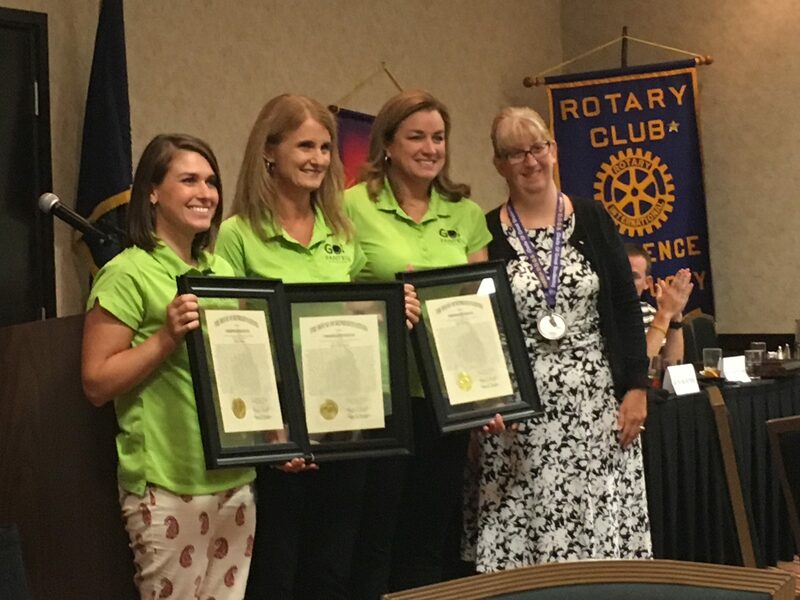 Left to right, Katie Hiatt , Laura Dumancic and Beth McIntire of GO Pantry display their awards, with Rotarian Julia Pile (photos by Mark Hansel). The award recipients have worked together to transform a grassroots initiative to feed hungry families in Boone County to a sustainable operation that provides meals for hundreds of families on a weekly basis throughout the school year and beyond. In 2012, Dumancic and McIntire were involved in a bible study group through their church when they became aware of food insecure children at their local elementary school. They pooled their resources, together with the others in the bible study group, and provided for the children and families. Over the course of time, they realized that their effort needed to transition into a sustainable operation and that’s when Hiatt entered the picture. From her time as a teacher running a small pantry at Walton-Verona Elementary, Katie provided the necessary experience to help transform the young organization into a sustainable operation. Her experience running a small pantry combined with Dumancic’s MBA and communication skills and McIntire’s planning and execution abilities combined to form GO Pantry. Laura Dumancic gets emotional as she talks about the community support GO Pantry receives. Kids, however, do take a vacation and it is during the summer that food insecurity can become even more of an issue. While in school, kids receive breakfast and lunch during the day but on the weekend, or when school is not in session, food insecurity becomes a real issue for many. GO Pantry is focused on filling that void. The group’s GO PACKS, which are weekend food packs delivered during the school year and GO BOXES, supplied during the summer, are designed to prevent kids from going to bed hungry. Families are referred to the program by the Family Resource Officer at their school. Dumancic was overcome with emotion as she took the podium to speak about the work of GO Pantry and the support the organization has received from the communities. Established in 1945, the Florence Rotary Club consists of nearly 100 business and community leaders from across Northern Kentucky. It is part of Rotary International, an organization of 1.2 million neighbors, friends, and community leaders who come together to create positive, lasting change in its communities and around the world. The Florence Rotary began recognizing the Citizen of the Year in 1995 and since its inception, has honored more than 30 inductees.